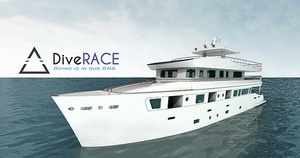 DiveRACE E Class is a new liveaboard launched in 2015 for luxury diving in Indonesia, Malaysia and Thailand. She is big, fast, safe and comfortable. There are 6 x luxury twin or double configuration cabins on the main deck which have their own private balconies. 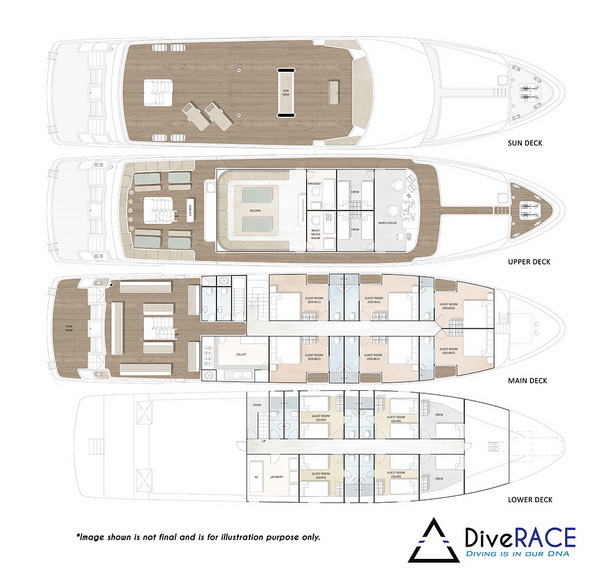 There are 4 group cabins on the lower deck that accommodate 4 divers in each cabin. 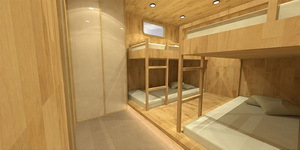 All cabins are air conditioned and have en-suite bathrooms. Cabins are cleaned daily and fresh towels are providded every day. Included in the above prices: Dive guide, tanks, weights & belt, all meals, towel, toiletries. * Guests are required to check if they can apply for visa on arrival (if necessary). Note: Dive Insurance is compulsory on DiveRACE E Class.